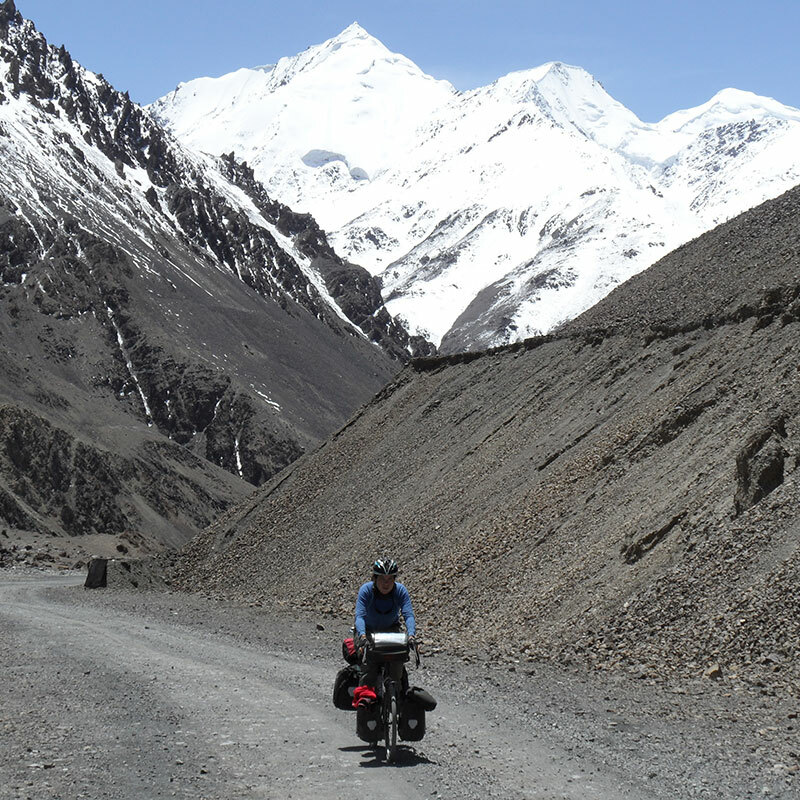 I had heard a lot about Emily Chappell, a former cycle courier who has been doing ultra-long cycle tours around the world over the last few years, and who has written a book about her cycling tales. As well as touring, last year she was the fastest solo female at the Transcontinental cycle race (of which the late Mike Hall was the director), a self-guided cycling competition in which riders travel around 4,000km to get from Geraadsbergen, Belgium to Canakkale, Turkey via the shortest route. 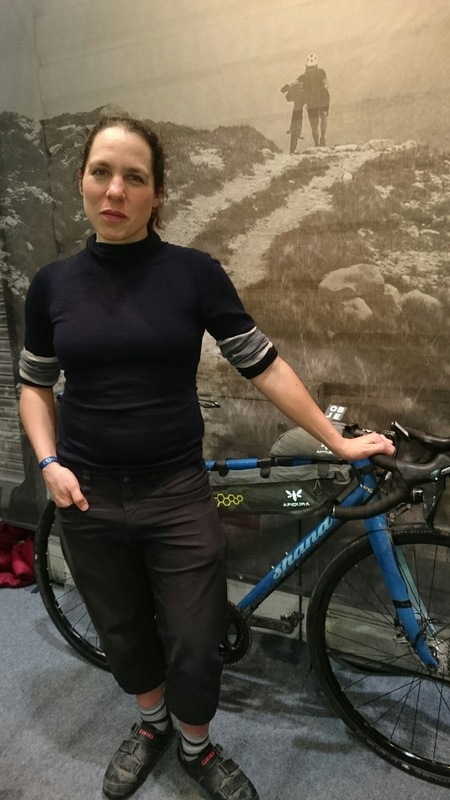 I finally got to meet Emily at the London Bike Show and she talked about the Transcontinental, her bike riding in general, plus life being an author and a director at the Adventure Syndicate. "I was born in Somerset but lived in mid-Wales as a kid. I started cycling as a child like everyone else does. Where I was, just South of Machynlleth, is a good place because with Snowdonia, Cambrian Mountains and Brecon Beacons nearby, you get good at cycling up hills very quickly! I moved to London after uni 11 years ago, got a bike at that time and started cycling around London. Firstly, I was commuting, then I got a job as a courier for a while. It was all this riding around London that got me more into cycling. I met a lot of people who were really into audaxes, so that made me realise you can do big distances by bike. I always had the ambition, buried somewhere deep down to do long-distance cycle touring, and Juliana Buhring was the main person who wrestled it out of me, and convinced me that this was something I really did want to do, and that I might possibly be capable of doing it. I didn’t go into the event thinking that I could win it. I am competitive - I want to try, I want to push myself and do well. But I didn’t really think very much about the fact that it was an actual race with lots of other people to compete against. I’m not a fast cyclist, and apart from a couple of Alleycat events, I was not a racer or a winner or someone who competes. But then as I got into the riding during the Transcontinental race, I started to realise I was okay at it, and began to think “Maybe I am one of the ones who could win.” So then, the pressure was on, and I just kept going, and won! Often, I had moments on the tarmac where I felt a bit tired, fed-up, down, sore and was riding along thinking how awful life is – then I’d hit the gravel, and because it’s quite hard work it’s all-consuming and focuses you. Then the time just passes quickly because you don’t have the energy to think about how much your feet hurt. You just keep going! Having said that, even I had moments when I thought, oh God, not more gravel! Particularly as it did slow me down a bit. There was one bit during the Transcontinental race where I strayed onto a route that was completely different from where everyone else was going. I had passed a checkpoint and went south to Albania, when everyone else went south-east. People could track what I was doing, and it would have been clear to them that this was not a deliberate route – I felt like I'd done something stupid, but I had a really good time! I didn’t get particularly lonely during the Transcontinental race, as I like being on my own. You see people at the start and then around the check points, and at the end you see more people. Also, along the way sometimes you are on a stretch of road where there is only one route option, so at those moments you see quite a few people. At times I was in the middle of nowhere having not seen another racer for a couple of days, and then I'd see someone I know who was in the race. So then I'd think, “you’re my friend, you’re my brother, I know you”. Other times, when I saw another racer, I’d get slightly more stressed because I’d suddenly start thinking “There’s a guy over there who is in the same race and he’s ahead of me; but I might be going a bit faster, so maybe I’ll overtake him. And if I overtake him then I have to keep that up, and ride a bit faster.” I was thinking all those things, and then suddenly there’d be all this tension. And then if I overtook him and decided to stop for lunch, I'd see him go past, and think – ah, now he’s ahead of me! In contrast, when I am on my own, I am just off riding my bike, and I can forget about all that competition, and it’s lovely. I am doing the Transcontinental again this year. There is a chance I could win, but there will be a number of people doing it who have done it before and who are much stronger than me. Also, I’ve been going around the entire cycling world saying “hey, more women should do the Transcontinental.” So I think a lot more women are entering because they’ve been watching it for a couple of years and they’ve started to think, maybe they could do that. The field will be much stronger this year, so if I do win, it will be a serious victory. If I do the best ride of my life but I don’t win, I’d still be happy. In January I did a 24-hour mountain bike race in January – the Strathpuffer, up in Scotland. It’s famous for being in winter. Although it wasn’t raining or snowing, it was very cold with a lot of ice around, and was held in 17 hours of darkness. The first few hours were okay, but then when it got dark the temperature dropped and all the rocks got slippery so you just fell off all the time. I crashed, and I have still got scarring from it. A few people even broke bones, so it was even tougher than the Transcontinental. I rode the Strathpuffer solo, and won – and I’m not even a mountain biker – it was really weird! Again, it was one of those things, where I thought, “That wasn’t supposed to happen!” I don’t think that will happen again! I must say I am still quite surprised that I have won a couple of races. I feel like I am not the sort of person who would win races. I have had to deal with that, and think, maybe I am that sort of person. And this year for the Transcontinental, everyone is saying, “Emily is the one to beat”. And I’m thinking, “No I’m not, no I don’t know what I’m doing!” It’s a bit of a mental leap to think I am someone that people want to win against. I never go out cycle touring without my conditioner. On the Transcontinental my luxury item was hair conditioner. Everyone laughs at that. It’s a tiny thing that takes up very little space, and I like to have it. If I’m only going to have a shower once in two weeks, I’ve got to have hair conditioner. I feel so much better with properly washed and conditioned hair! I am a director of the Adventure Syndicate, a group of female cyclists who are basically trying to take over the world and get more women riding bikes in all sorts of different ways. It’s a really fun thing to be doing. That is a fully fledged full-time project that I spend a lot of my time on. We really want to inspire women, not just talking about the triumphs in what we do, but also our doubts, fears, weaknesses and failures – things that many people would relate to more. We also hold events, such as presentations, and cycling weekends away. As well as bike riding, and working at the Adventure Syndicate I spend time writing articles, and I’ve hopefully got a second book coming out, time permitting! It'll be the story of how I got into long-distance racing. Becoming an author has been exciting, as it was my childhood dream. So it was quite surreal when it happened. The six-year old me always thought I would have a book with my name on it. I gave up on that and thought it wouldn’t happen. And then last year I held a book in my hand that I'd written, and it felt lovely! Knowing that there will always be a book I wrote on a few people’s shelves is a nice feeling. It started when the agents came to me a few years ago. I had a blog I wrote for a while when I was travelling, and more people started reading it. Then one day a literary agent approached me. With her, I wrote the proposal, and she sent it to a few publishers. I didn’t think it would come to anything, but then a week or so later the agent got back to me with a huge list of people who were interested. Even though I got a publishing deal, it was not until a couple of days after the book launched I started to realise, this was actually happening. The launch party for my first book, What Goes Around was lovely because it was in a book shop, and basically all my family and friends attended. It was like a wedding. I don’t think I’m ever going to get married, so the launch was like a wedding for me! Launch week was different because there were lots of media interviews. It’s just a bit strange because you’re kind of acting like this person that everyone wants to interview, but you know you are really just….yourself! You are trying to kind of step into this mould, but at the same time you are looking at yourself and thinking, this is a weird way to be living my life! That period was fun, and enjoyable, but it was also quite nice to finish that phase and get back to real life. My life has changed since the book launch, but not in a big way. I haven’t become rich and famous, but I am doing more of the things I like doing. I have been offered more writing gigs, so I was able to stop couriering and work full-time as a writer and speaker. It has been great to have been invited to give talks and readings in some interesting places. So I am enjoying living my life the way I want to spend it. I’m not making a fortune but I kind of get by, and I am back in mid-Wales where I really love cycling. 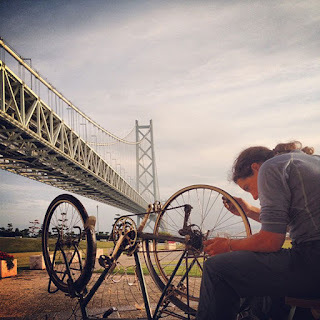 What advice would I give to women who might want to do ultra-distance cycling? 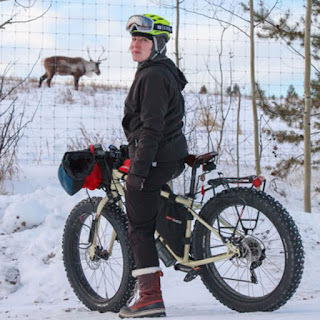 I think a lot of women have mental barriers to getting out and riding, along the lines of “I can’t” or “someone like me couldn’t do that” or “that’s something someone else does.” Talking to people you realise they aren’t really scared of anything specific, they are just scared of the unknown. I’ve never done something I was afraid of that ended up being worse than I thought. I have never done anything I was afraid of and it hurt me. And I have never regretted doing something that I was initially afraid of. And the more times you do something despite feeling the fear, the more it just feels like something you have to get through to get to the better bit. Cycling is my life. I ask myself now, what would I be doing if I wasn’t cycling? It’s the thing that keeps my life rolling. It gives me so much – my exercise, my travel, my social life. It gives me things to write about and think about. Cycling is not just a sport, it’s a wonderful lifestyle. Having this one thing in my life makes everything else better."